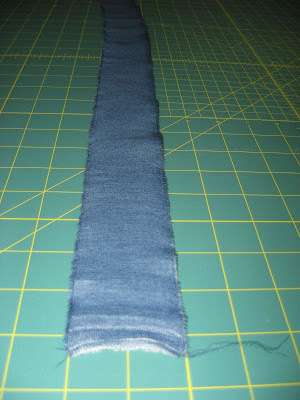 Hooked on Needles: Rip 'n Strip -- my fun, fast method of quilting! How do you begin a new project without spending lots of time looking at patterns and going shopping for fabric? I like to see what I have on hand that might be looking for attention. Then I spread it out and rearrange it a few times, then I ponder the different ways I can put it all together. Sometimes I even bounce ideas off of the occasional visitor and see what kind of feedback or advice I might get in return. This past weekend, after finishing the sewing kit for my giveaway and the two quilted book covers which that same Connecting Threads kit made, I decided it was time to pull out the blocks I received in Karen's I Spy swap last fall. I had already pulled out 24 blocks that were particularly boy-ish with the thought that I would make a small quilt for a boy. 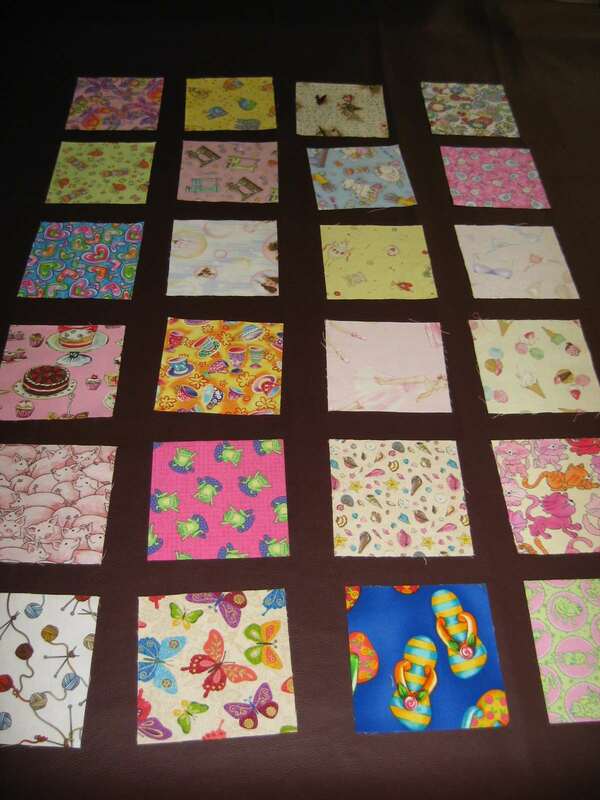 I also had pulled out 24 blocks that I thought looked particularly girl-ish, having a girl's quilt in mind. Once I had determined that denim would be the perfect fabric for in between all the blocks, I zipped down to my local Joann Fabrics and picked out a wonderfully lightweight denim fabric that was 60 inches wide. Not having a coupon available, I only purchased 2 yards, figuring that would be enough to get me started and give me time to find a coupon so I could buy more. 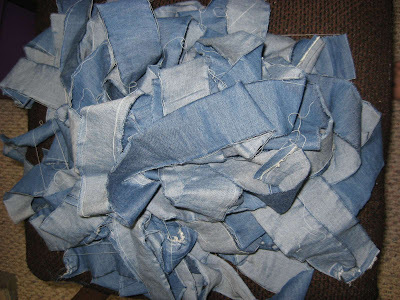 I was in the mood for some instant gratification, so instead of rotary cutting lots of strips and little pieces for a regular sashing, I decided to rip 2 inch strips of denim. ...a luscious pile of 2 inch denim strips in no time at all! Such good therapy! I stitched all the blocks onto the strips, one after another, joining a new strip at the end of the previous one by overlapping the selvages. 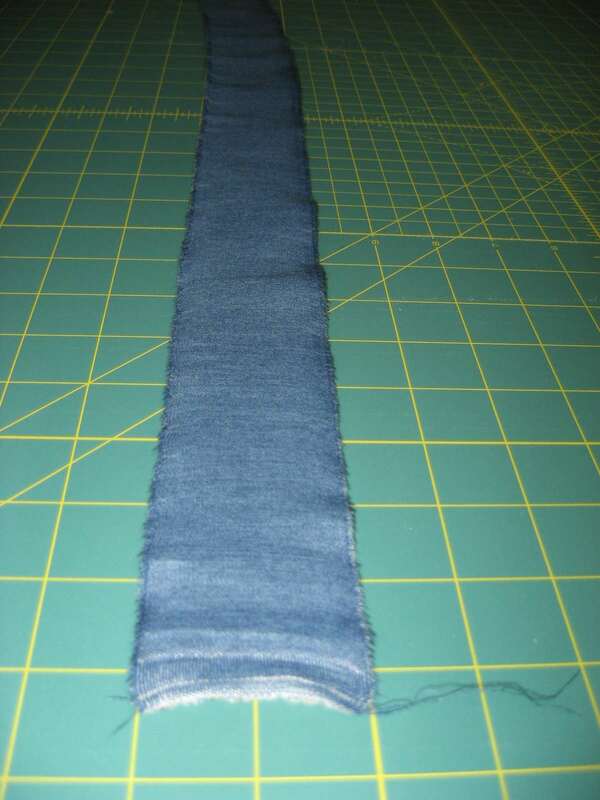 Once one side of all 24 blocks was sewn onto the strip, I snipped the strip between the blocks just enough to cut the stitching thread and then ripped the strip apart to separate the blocks. Then I turned the blocks around and stitched the opposite side of all 24 blocks onto strips in the same way, snipping between the blocks and ripping to separate at the end. 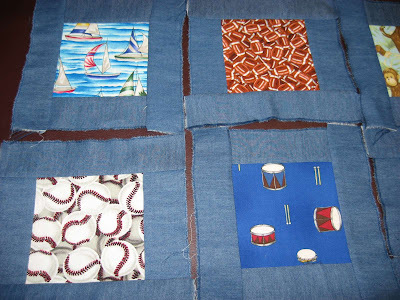 Then I pressed the seams away from the blocks on both sides. 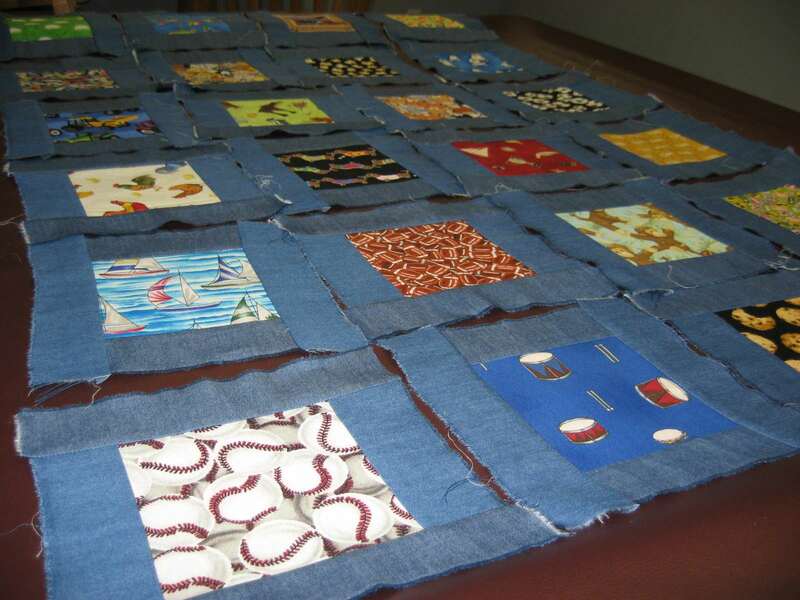 In the same manner as before, I stitched the third side of all the blocks, now with denim sashing on top and bottom edges, to more strips of denim, snipping and ripping them apart at the end. And finally the fourth side was stitched, snipped, ripped and all seams pressed. It only took me about 2 hours to surround all 24 blocks with 2 inches of denim! I'd call that instant gratification! 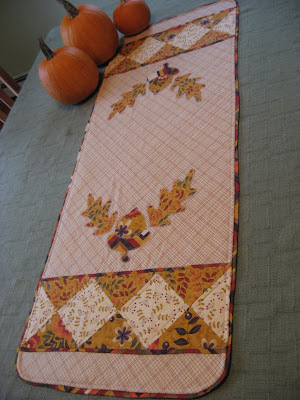 This is how I will arrange them to join them into the quilt top, with the long and short edges offset from each other. I think that adds a little more interest to the quilt. The next thing I will do is square up each block to a uniform size and then stitch them all together. I think I will rummage through my fat quarter collection and do some kind of scrappy backing for this one and I'm thinking a fun red fabric for the binding. What do you think? I'm open to any suggestions, even if you're not stopping in for a visit to my home! I think red would look great on the back. A scrappy back would look nice too. Looks great. Top idea for a boys quilt. Red binding would be awesome...especially a stripe! Great quilt. Looks like you had fun! I can't wait to see the finished top. I would love to see a video tutorial on this one! I tried to follow the written steps, but being a visual learner, always get more out of a video. Yes to the red binding! 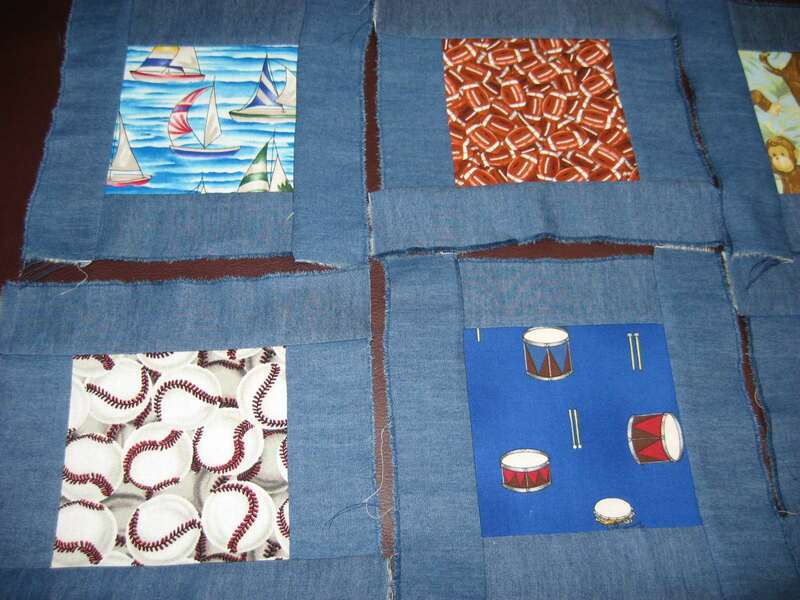 Great looking quilts that kids will love! Red binding would look good but how about lime green for something different? 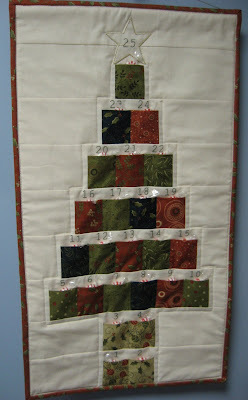 Great quilt and so simple! 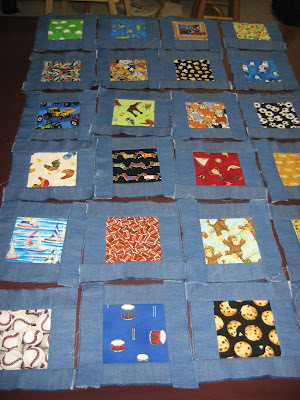 I really love this quilt - would be so much fun to make one of these for my little three year old grandson. The I Spy idea is great. That looks like fun! I agree with the red. btw. So much to celebrate this weekend! Charity Quilt is finally complete!